It was the Manny Machado effect -- shortly after the star signed his $300 million contract, the San Diego Padres generated over $2 million in additional ticket revenue. So if we're calling that "Manny Money,” what about "Donovan Dollars?" How has Landon Donovan, arguably the greatest American soccer player of all-time, impacted the San Diego Sockers bottom line? Well, it turns out Donovan is great at soccer and great for business. “Booming!” That's how Craig Elsten, chief marketing officer for the Sockers describes business since signing Donovan, “It’s been a major change." The biggest change is the crowd. Attendance at Sockers home games has more than doubled. "We were around 2,600 prior to Donovan, the average has been around 5,800 in 3 matches since," said Elsten. Donovan deflects being the sole reason for the boost, often sighting the talent on the team as a whole and the excitement of the in-game atmosphere at Pechanga Arena. “When people come here and watch the game and feel that energy, people want to come back, kids want to come, families want to come back, they want to come back,” said Donovan. So, say 3,000 more fans per match and the average ticket price is $20 -- that's roughly a $60,000 increase in ticket revenue per game. And all those extra fans mean merchandise, lots of merchandise, is being sold. Since Donovan came aboard, Sockers merchandise sales have increased by 500 percent, according to Elsten. “Anything with a 9 and Donovan on it seems to be selling pretty well," he said. On February 15, Donovan's first game, the Sockers sold $13,000 worth of team gear. 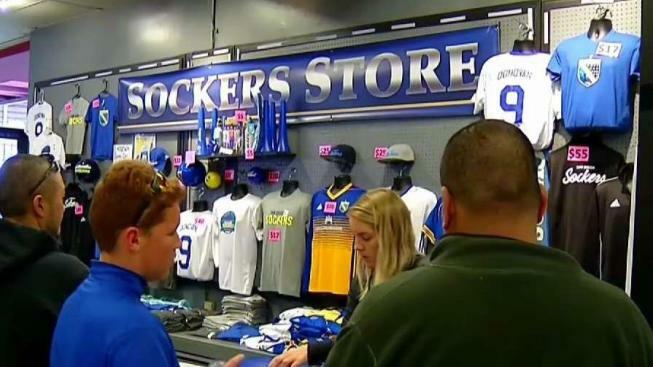 Since then, the Sockers have run out of some merchandise items, something that’s never happened before. "In our merchandise department, it’s been a seed change. They probably thought they had ordered for year, then it’s like we need more, we need more," Elsten said. It's not just at games that people are consuming Sockers content. According to TV Eyes, a broadcast tracking service used by the Sockers, from January 23 when the team signed Donovan through his debut on February 15, Sockers content on TV and online in the San Diego market had over 3.3 million views, an estimated value of over $300,000 to the Sockers organization. When reciting those numbers, Elsten smiled big and added "when 3.3 million people see your product and there’s only what a million in the county, that means they all saw it three times! That’s getting the message out in a way that the Sockers could never have purchased on their own." When you zoom out and look at the big picture of Donovan’s impact, it's all about exposure and that's invaluable. "One of big things we knew Donovan would bring to the Sockers and the Major Arena Soccer League (MASL) is legitimacy. It puts you in the conversation," Elsten said. That conversation is now national. Sockers stories are suddenly on ESPN and national networks are showing highlights of Donovan’s indoor goals. It's great for the Sockers brand and the MASL as a whole. Donovan’s salary with the Sockers is $250,000 per year, so far he's worth every penny because the Sockers expect to recoup that cost and then some, the organization figures to be in the black when it comes to Donovan’s deal. Which leads to a bigger question we asked Elsten: Does Manny Machado play soccer? “I’d like to find out, but I don’t think we have $300 million available, though."